The 100 Year Journey - Sermon by Fr. Vazken Movsesian on November 17, 2013 at St. Garabed in Rancho Mirage, California on the "100 Year Journey." This is part of a commemorative series of sermons highlighting the martyrdom of one of the Armenian Church clergyman during the 1915 Genocide. In this installment, Fr. Ashod Avedian (1868-1915) is highlighted. Sermon delivered and recorded LIVE. The Messengers and the Messages we receive in life and our relationships. Sermon delivered by Fr. 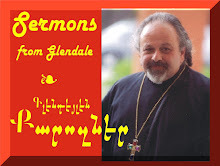 Vazken Movsesian on November 10, 2013 - Recorded LIVE at the St. Peter Armenian Church and Youth Ministries Center. Who is it that lives and does not sin? Why the Saints are necessary and a blessing in the life of the Church. Sermon delivered by Fr. Vazken Movsesian on November 3, 2013 on the theme of All Saints Day and the "Family of Christ" See Luke 8. Recorded LIVE at the St. Peter Armenian Church and Youth Ministries Center. Armenian Language at beginning; English Language begins at minute 11:30.